Reáchtálfaidh Conradh na Gaeilge ócáid ar leith i mí Feabhra mar chuid den cheiliúradh a bheas ar siúl i gcaitheamh na bliana le linn do Learpholl a bheith mar Phríomhchathair Chultúrtha na hEorpa. Bainfidh an ócáid seo leis an ealaíontóir Cesca Trench, ar Ghaeilgeoir í. Rugadh í i Learpholl sa bhliain 1891, agus fuair sí bás i mBaile Átha Cliath i 1918 i rith na heipidéime fliú. 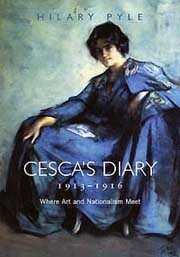 Foilsíodh leabhar dar teideal Cesca’s Diary 1913-1916: Where Art and Nationalism Meet le Hilary Pyle in 2006. Tá an leabhar bunaithe ar an dialann a scríobh Trench i rith na tréimhse sin. Craoladh clár faisnéise den teideal céanna ar TG4. Beidh Hilary Pyle ag tabhairt léachta faoi Cesca Trench ar an 21 Feabhra ag 6.00 p.m. in Institiúid Léann na hÉireann, Ollscoil Learphoill, 1 Abercromby Square. Faraor, ní raibh muid ábalta pictiúir de chuid Trench a fháil ar iasacht ó Ghailearaí Náisiúnta na hÉireann, ach tá súil agam go mbeidh siad le feiceáil sa chathair seo ag am éigin sa todhchaí sa dóigh is go bhfeicfidh daoine saothar de chuid Ghaeilgeoir na háite seo. Cé nach mbeidh na saothair iad féin ar fáil, cuirfidh Hilary Pyle roinnt sleamhnán i láthair don lucht freastail a mbeidh pictiúir de chuid Trench le feiceáil orthu agus taispeánfar an clár a craoladh ar TG4 chomh maith. Rugadh Trench i dteach an mhinistir ag The Parish Church of St. John the Baptist i gceantar Tuebrook, áit a raibh a hathair, Herbert Francis Chenevix Trench, ina eaglaiseach. B’as Baile Átha Cliath dó agus bhí a athair féin ina ardeaspag ansin. Leac chuimhneacháinNuair a d’iarr craobh Learphoill de Chonradh na Gaeilge ar Paul Nener, ar biocáire é in Tuebrook faoi láthair, cead a thabhairt dúinn leac chuimhneacháin a chur ar an fhoirgneamh, dúirt sé go mbeadh sé lánsásta dá ndéanfaimis amhlaidh.Thug Nener pictiúir den séipéal do Hilary Pyle agus í i mbun taighde dá leabhar. 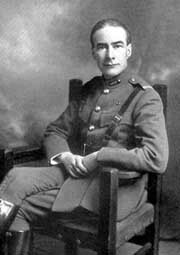 D’inis sé dom go raibh leac chuimhneacháin do Herbert Trench agus cailís álainn a bronnadh ar an bparóiste ina chuimhne sa séipéal fosta. Áit stairiúil atá sa séipéal seo, ar foirgneamh liostaithe é. Mar sin, b’éigean dom cead pleanála a fháil ó chomhairle na cathrach leis an leac a chur in airde air. Tá a lán maorlathais ag baint le próiseas mar seo, rud atá ag cur moille ar an tionscadal. Ach thig linn an leac a nochtadh níos déanaí sa bhliain, más gá. Éirinn, áit ar bhuail sí le Dubhghlas de hÍde i mí Dheireadh Fómhair, 1892. 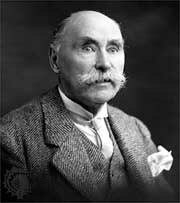 Pósadh iad i Learpholl bliain ina dhiaidh sin, i mí Dheireadh Fómhair na bliana 1893.Trí mhí ní ba luaithe, ar an 31 Iúil 1893, tháinig de hÍde agus leithéidí Eoin Mhic Néill le chéile agus bhunaigh siad Conradh na Gaeilge i mBaile Átha Cliath. Mar chuid de chomóradh céad bliain an Chonartha, a ceiliúradh sa bhliain 1993, rinne craobh Learphoill den Chonradh plaic chuimhneacháin a nochtadh ar an 10 Deireadh Fómhair, céad bliain – go dtí an lá – ó phós Dubhghlas de hÍde agus Lucy Kurtz ansin. Tá an scéal seo an-tábhachtach mar fhreagra ar an cheist, "What ish my nation?" agus tá tábhacht ag baint leis ó thaobh fhéiniúlacht na nGael in Learpholl fosta, go háirithe i mbliana agus muid ag ceiliúradh stádas na cathrach mar Phríomhchathair Chultúrtha na hEorpa. D’ainneoin na ndeacrachtaí ar fad a bhí againn – an Gorta Mór, na Trioblóidí agus mar sin de – tá ár gcultúr fós againn anseo agus tá clár imeachtaí socraithe le ceiliúradh a dhéanamh ar stádas seo Learphoill i mbliana. I measc na n-imeachtaí a bheas ar siúl, beidh cinn á reáchtáil ag Comhaltas Ceoltóirí Éireann, ag an Scoil Rince, ag Cumann Lúthchleas Gael Learphoill agus, dar ndóigh, ag Conradh na Gaeilge. Ar an téama céanna, tá léiriú de chuid Cesca dar teideal, “Piaras Béaslaí and Another in a Pageant (c.1914)” sa leabhar Cesca’s Diary agus deir Hilary Pyle fúithi:"She decided to try for the fáinne, a symbolic gold ring awarded by the Gaelic League for proficiency in the Irish tongue, and was proud to put her name forward at the same time as the revolutionary writer, Piaras Béaslaí, who had commanded a battalion in North King Street during the Rising." Seo Gaeilgeoir eile a rugadh agus tógadh i Learpholl, cé nach raibh sé sásta an méid sin a admháil (féach Beo!, eagrán 42, Deireadh Fómhair 2004). Níl Breckfield Road South, an áit ar rugadh Béaslaí, ach míle ón áit ar rugadh Cesca í féin. Níl a fhios agam cé acu an raibh a fhios acu faoin chomhtharlú seo nuair a bhuail siad lena cheile i mBaile Átha Cliath. Fuair An Béaslaíoch: Beatha agus Saothar Phiarais Bhéaslaoi le Pádraig Ó Siadhail an chéad duais sa chomórtas "Léirmheastóireacht ar Fhiolíocht/Saothar Próis" ag an Oireachtas i gCathair na Mart anuraidh agus tá súil againn go seolfar an leabhar i Learpholl mar chuid den cheiliúradh i mbliana. Nocht An tOllamh Ó Siadhail leacht cuimhneacháin do Bhéaslaí ar Breckfield Road South in 2004.
agus fuair sé bás sa Royal Liverpool Infirmary Workhouse ar an 3 Feabhra 1911 (féach Beo!, eagrán 25, Bealtaine 2003). Nochtfaidh Reg Johnson, duine muinteartha le Noonan, an leacht ag 10.30 a.m. Dé Domhnaigh, 3 Feabhra ag The Old Royal Liverpool Infirmary, Pembroke Place, Learpholl. Beidh fáilte roimh chách. Ach tá níos mó ná stair i gceist lenár gcultúr anseo agus tá grúpa tuismitheoirí ag déanamh iarrachta anois ar naíonra a bhunú sa chathair. Má atá suim agat ann, cuir ríomhphost chuig John agus Ambreena Harrington ag sugradh@yahoo.co.uk.Is de bhunadh Éireannach é Tony Birtill agus rugadh i Learpholl é. Bíonn sé ag obair le hOideas Gael i nGleann Cholm Cille gach samhradh.